Last night, Tyler Sash, of the Super Bowl Champion New York Giants, attended a Junior college, non-conference basketball game, to support his brother, the assistant coach. Our son plays in the Jazz Band for the college they were playing and we went early to hear all of the pregame show. Derek pointed him out to my husband who went over to say hello. The way Tyler grinned and gave him a fist bump made me think they had already met. Tyler Sash was thanking a volunteer – a lifetime volunteer. My husband started parking cars at the home football games the first year we were married. When a spot on the “chain gang” opened up it was offered to him. He has been at almost every home football game for three decades. When our children started school, they issued a courtesy family activity pass to him. We got in to all the games, concerts and plays for free or a reduced price. With three kids, that must have saved us thousands. He also was a volunteer youth basketball and baseball coach. His volunteering for the baseball team turned into a part-time summer job. 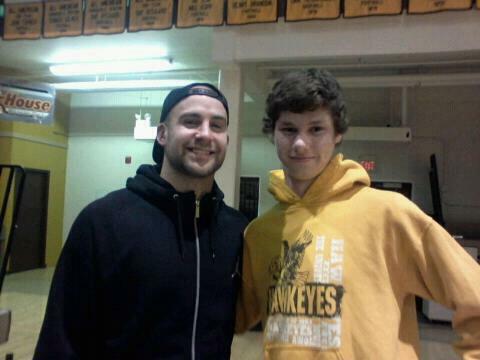 Invest in your school by volunteering; the rewards are priceless – like the photo I snapped of Derek with Tyler Sash. This entry was posted in Give It Away, Important Things and tagged Giving, home football games, Important Things, new york giants, youth football team by Frugal Fish. Bookmark the permalink.